You may have noticed a decided lean towards the food aspect of this blog of late. 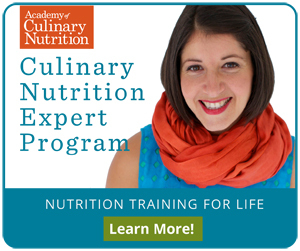 As I mentioned before, I’m enrolled in a culinary nutrition program with Meghan Telpner Inc. and wow, it’s been a little more engrossing than I’d anticipated. 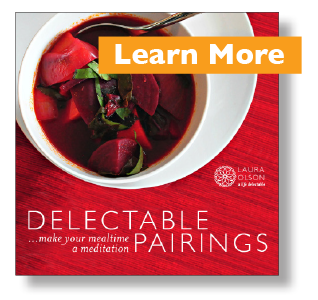 So while I’ve been studying food constantly, I haven’t had as much time to share my recipes with you. Also, we’ve been cooking a lot of recipes we’re not at liberty to share. BUT, I finally have a winner here of my own. And, I’m excited to share it with you before pumpkin season is over. 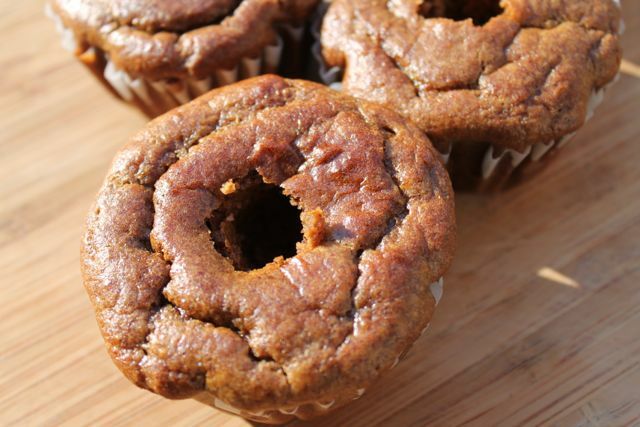 I have always loved fall-spiced muffins, from way back in the day when my Dad and I used to breakfast together. We’d order them at a local diner, cooked on the griddle then slathered with more butter (OY!). So, when a certain coffee company came out with the cream cheese frosting filled pumpkin muffins that appear every fall, I had a little issue with self control. I’d go into one their many locations for my morning coffee, and even though I knew they were bad for me, even though I knew they weren’t really that tasty, each fall for a couple of years I’d just give in and order one. And feel icky after. And disappointed with the taste. 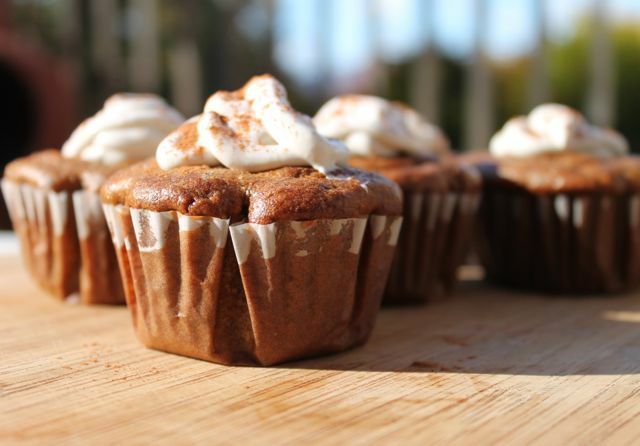 These sweet and healthy treats are my attempt to upgrade my fall craving. 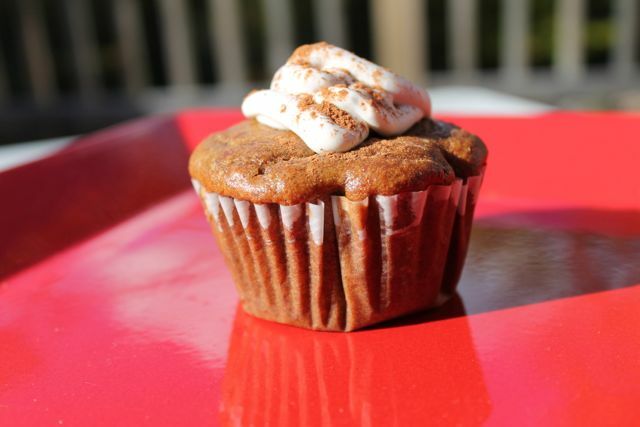 You’ll never want another scary commercial pumpkin muffin again. There are two options here. 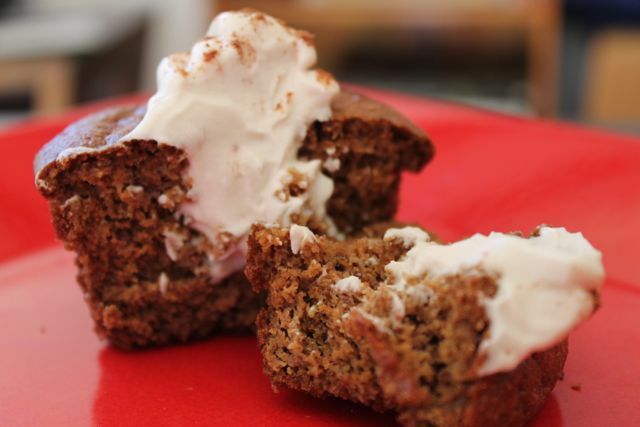 The first is best in a high-speed blender, and tastes a little like a vanilla cream cheese frosting. The second is the coconut whipped cream trick that’s been around the blogosphere for ages, and doesn’t require anything more fancy than your mixer. Either way, trust me, you’ll be happy. Be sure to read all the way through the instructions even before shopping for ingredients, to make sure you have enough time and ingredients to insure great cream! Optional: 3 heaping tablespoons prepared Irish Moss gel. This will make the cream a little fluffier and add a nice digestive healing component. See Meghan Telpner’s blog for instructions. Completely not necessary for the cream to turn out! Start at least 24 hours ahead of time, or more if you can. Place the coconut milk in the refrigerator to get cold. After at least 12 hours, or 24 hours if you have the wait time, open the can and scoop out the white cream, which should be on top. If it does not seem to have firmed up, place it in the freezer for one hour, then try again! When you get down to the water, stop scooping. Try not to get any of the water. Save this for yummy smoothies! If the white cream is still more liquid than solid, place in the freezer for ½ to 1 hour to firm up. Place all ingredients in a high speed blender and blend on high until smooth. Return to the refrigerator to chill. The coconut whipped cream trick. Start 24-48 hours ahead of time. Place the coconut milk in the refrigerator to get cold. Open the can and scoop out the white cream, which should be on top. It’s great to put it in the bowl of your stand mixer if you have one! If it does not seem to have firmed up, place it in the freezer for one hour, then try again. When you get down to the water, stop scooping, even if there appears to be cream mixed in to the watery liquid. Add all ingredients except coconut oil to the bowl of your stand mixer or a medium bowl. Whip with the whisk attachment of your stand mixer on high speed, or with a hand held mixer. If you have a properly thickened can, it will eventually look like medium/firm peaks. Put it in the fridge to thicken further and chill while you make the muffins. You may get a watery can. They’re out there. Keep two in the fridge at a time for best probability. I like Native Forest as I have had best “thickening” results with that brand. If you do get a watery can that won’t thicken, put the cream into a blender with ¾ cup cashew butter or 1 cup cashews and 1/4 cup coconut oil to make something more like option 1. Line a standard muffin pan with paper baking cups. In a medium bowl or the bowl of your stand mixer, beat the eggs well. 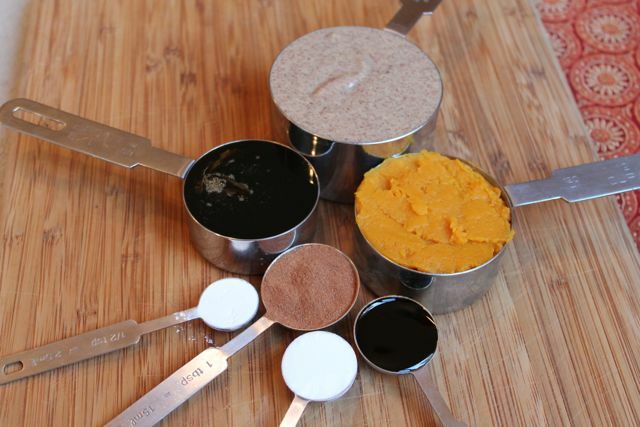 Then, combine all remaining ingredients except baking soda and baking powder, and blend well. Finally, add the soda and powder and blend to mix. Let the batter rest for a few minutes. Do not skip this step! The resting gives the soda and powder time to react. Distribute the batter evenly among the cups. Bake for 20 minutes, or until a toothpick comes out clean and the muffins feel fairly springy when pressed lightly with a finger. Remove from the oven and allow to cool in the pan for 10 minutes, then transfer to a cooling rack to cool completely. Insert a ¼ teaspoon measure or a small melon baller into the center of your muffin and turn it in a full circle then remove it pulling out the section of muffin and leaving a gap. Be careful not to go all the way to the bottom, I’d say scoop down about 2/3 of the way. Save these crumbs for tasting so you don’t devour the whole batch of muffins right away. Very important! Scoop a generous amount of cream into a Ziploc bag, sandwich bag or pastry bag and squeeze it down toward the corner. If using a Ziploc/sandwich bag, snip the corner off. Squeeze a generous amount of cream into each muffin opening then swirl it up and over the top, spiraling up to a peak. Top with a sprinkling of pumpkin pie spice. Eat immediately or store in the refrigerator. If you have runnier cream, it will firm up in the refrigerator, even though it might be more of a smooth circle on the top of your muffin than a pretty peak. These will keep for a few days in the refrigerator, but I doubt they’ll last that long. This entry was posted in Delectable Delights, Food Smarts, Recipes, Sweets & Treats. Bookmark the permalink. Oh my, these were indeed delectable! Thank you for sharing them at this morning’s HV Create gathering. I would have liked you even if you didn’t feed me… 😉 Look forward to connecting again soon. Sharon, you are too sweet. Do be in touch soon! And have a happy holiday season. Hope it involves healthy cupcakes and deeply satisfying creating for you!